After working together in an afternoon series titled ‘Nasaan Ka Nang Kailangan Kita’ (NKNKK)—the two young stars—Jerome Ponce and Loisa Andalio are back as a loveteam in ‘Wansapanataym’s Candy’s Crush’ episode. Loisa plays Candy while Jerome is Paolo, the apple of Candy’s eyes. Both stars have come to like each other and the said project has given them the chance to be closer and be more comfortable with each other. Anadlio, at 17 considers Ponce, 21 as her older friend. Though Jerome admits that he has a ‘crush’ on Loisa, the latter just blushes after hearing the lad’s revelation of feelings during a recent set visit attended by the press. The said episode of ‘Wansapanataym’ will premiere today, June 26 with Andoy Ranay as director. The latest Kapamilya teleserye titled ‘Be My Lady’ premieres today, January 18 with real-life sweethearts—Erich Gonzales and Daniel Matsunaga as the lead stars. It is a romantic and light drama about an interracial relationship between a certified ‘dalagang Pilipina’ named Pinay and a Japanese-Brazilian hunk named Phil. The series capitalizes on Three Ps. The first ‘P’ stands for ‘Pag-ibig’ since the series is primarily a love story between Pinay and Phil. The series takes pride in the two leads—Gonzales and Matsunaga who will provide a different kind of ‘kilig’ for its fans and the televiewers for they will be as natural in their acting as lovers as opposed to other tandems on television today. According to Ted Boborol, the director of the series, the DanRich loveteam is a delight to watch since both help each other in making their scenes together easy and not pretentious. “Hindi pilit ang dating ng dalawa,” says Boborol. The second ‘P’ is about the normal struggles of a ‘Pamilyang Pinoy’—to be able to provide better future for the family members, which pushed both Pinay and her mom—Marcy portrayed by Janice de Belen to work overseas for greener pastures. While the last ‘P’ is for ‘Pangarap’ or dream or ambition of someone to making a difference in this world, the universe rather. The love story of Pinay and Phil is a tested formula that makes the ordinary ‘hopeless romantic’ Filipino would surely patronize. It has a simple premise of boy-meets-girl but with unusual twists and turns in the characters external and internal conflicts alike. It also points out that love knows no boundaries—whether what kind of race two people have—the likely two people of different colors and cultures will still fall in love with each other, no matter what. The DanRich tandem can be likened to a modern-day Romeo and Juliet. JanPri: Another Tandem to Watch Out for. Another interesting angle for the daytime audience to watch out for is the casting of both Janice de Belen and Priscilla Estrada. It can be traced that both de Belen and Estrada have one thing in common and that is John Estrada. Janice was the former wife of John, who is now the husband of Priscilla as the latter opted to carry the last name of her husband. Both women will portray mothers to Pinay and Phil, respectively. It will be intriguing to see both women carry their scenes together especially in dramatic moments as Marcy Crisostomo and Chelsea Oliviera. 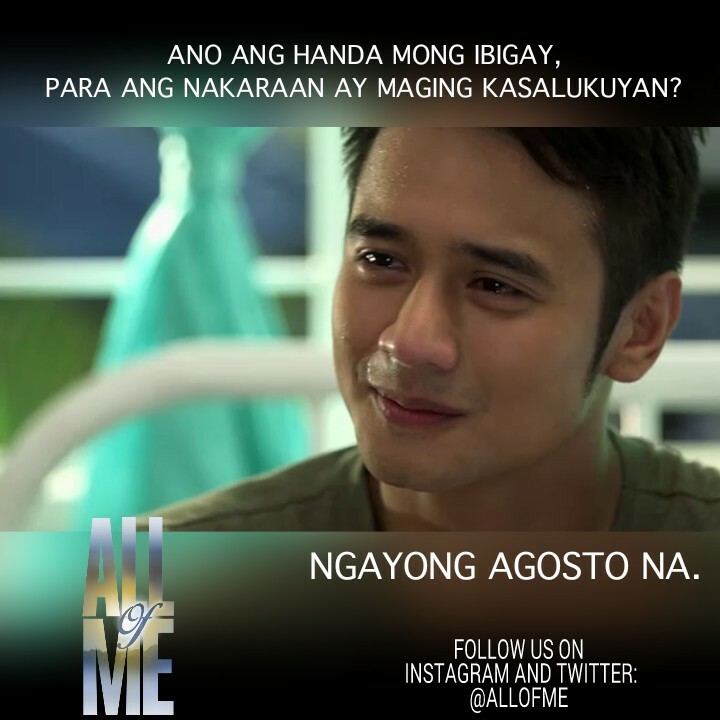 If the film 1990 American romantic fantasy film was a huge hit back then, it is certain that the latest addition to the Kapamilya Gold block, which is titled—‘All Of Me’ and is set to premiere on Monday, August 31. It is predicted to be a certified top-rater due to its story and its characters as it highlights love as a channel of blessings and not as an isolated island. De Guzman plays the younger Dr. Manuel Figueras. Image courtesy of ‘All Of Me’ facebook account. The said series marks JM de Cuzman’s major TV comeback as a lead, as the young good-natured, but ambitious, loving and charitable Dr. Manuel Figueras. He will be paired with a promising young actress Yen Santos as Lena, the immature and sincere love interest. Playing the senior Manuel is veteran actor—Albert Martinez. Manuel’s former protégé, Dr. Henry Nieves is ably portrayed by Arron Villaflor. The love triangle will be an interesting plot to hook its audience to watch the said series. Also in the cast are Ana Capri, Neri Naig, Micah Muñoz, Jordan Herrera, Sue Ramirez and a lot more. Jaime Fabregas, Ina Raymundo and Angel Aquino have their cameo roles as the doctor-philathropist, his first wife Diana Figueras and Manuel’s mother. The story centers on Manuel’s question about how much more of him is he going to give in the name of love since he already has the ‘fear’ of losing all the people he loved in the past. Its major conflict is when Manuel had the chance of coming back as his wish was granted by a fairy, but no longer the same Manuel—this time a much, much younger man and only to find out that his wife Lena is now in love with Henry. ‘All Of Me’ is directed by Dondon Santos and promises to provide a cinematic feast for its viewers eyes and a much fast-paced storytelling. It will be shown right after ‘It’s Showtime’.